Amazing sounding, low-profile 2 x 12 in. cab with front-loaded design, wide dispersion and tight low end. Fryette FatBottom cabinets have been used on countless recordings and tours delivering tight, focused power and consistent tone night after night. 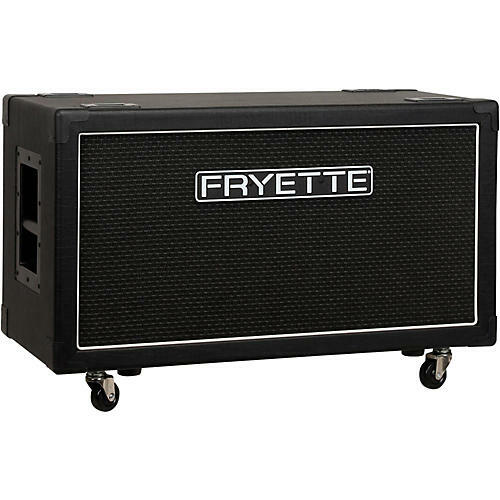 The 100-watt Fryette FatBottom FB212 is a low-profile, straight 2 x 12 in. speaker cabinet with a vertical baffle, featuring Mono-Stereo input capability. Impedance is 4 ohm in mono mode and 16 ohm/channel in stereo mode. Plug-in casters included. FatBottom Series Speaker systems feature high-quality Baltic birch materials, manufactured on CNC (computer numerical control) cutting equipment for accurate assembly and bulletproof construction. The FatBottom's custom Eminence P50E 12 in. speakers are front mounted for wide dispersion and excellent low-end control. Front mounting the speakers also allows for a well-sealed enclosure with virtually no air leaks, delivering extended projection and excellent power handling capacity. Dimensions: 29-3/4 x 14 x 16 in. Get surprisingly great projection in a compact package with the FatBottom 212 cabinet. Order today.